双语：忘掉自拍杆吧，可口可乐推出智能自拍瓶 - 休闲乐园 - 英语听力论坛 -英语听力,英语学习 - Powered by Discuz! Coca-Cola is taking the 'millennial narcissism' culture to the next level with a new gadget that lets consumers snap selfies while sipping its soda. The firm has unveiled a custom designed 'selfie bottle' complete with a built-in camera at the base. It uses sensors to take pictures when the bottle is tilted past a 70-degree angle capturing you mid-drink. All the images captured by the gadget, created for the firm's latest ad campaign, are automatically shared to Coca-Cola's Facebook, Instagram and Snapchat. Coca-Cola Israel is the mastermind behind this 'game-changing' product, which was inspired by a gap in the market for novelty drinks, reports Business Insider. The beverage giant then turned to Israel-based Gefen Team to help make this device a reality. 'Users tag themselves and their friends in photos on Coca-Cola's social media assets,' Gefen Team said in a statement. 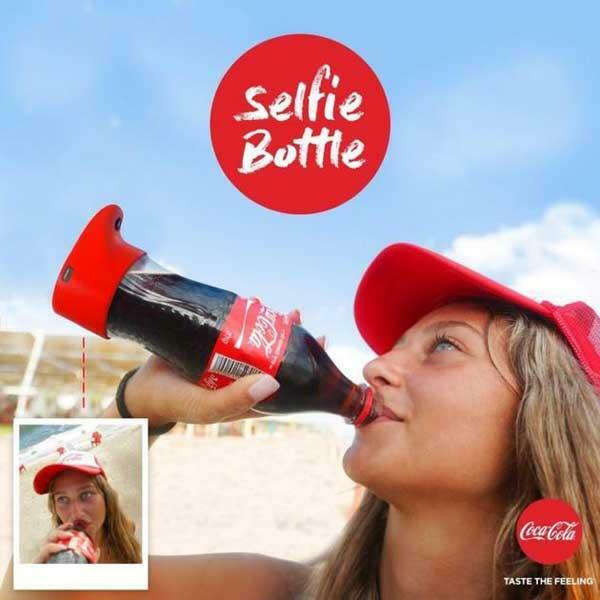 The selfie bottle was created for the Coca-Cola Summer Love, which is the largest brand outdoor event in Israel. Every picture snapped with the gadget during the festival is posted to Coca-Cola's Snapchat, Instagram and Facebook pages allowing individuals to capture moments while still enjoying the sugary beverage. It has not yet been made clear if this device was just a promotional piece for the event or if it will make its way to the masses. DailyMail.com has contacted Gefen Team for comment and has yet to receive a response. Although many believe snapping selfies is a way to boost your ego or feed your narcissistic needs, a recent study from the University of California found it may be enhancing people's overall well-being. Researchers found that regularly snapping selfies and sharing the images with friends boosts people's mood and ultimately makes them happier. The findings suggest that taking one selfie a day will improve your confidence and make you more comfortable with yourself. Researchers asked a group of college students record their moods, take photos and report their emotional state over the course of four weeks. The first was a selfie, to be taken daily while smiling, then a snap of something that made them happy and the third was a picture of something the photographer believed would bring happiness to another person (which was sent to that person). The team collected close to 2,900 mood measurements during their study and found that subjects in all three of the photo groups experience increased positive moods. Some in the selfie group reported being more confident and comfortable with their smiling photos over time. GMT+8, 2019-4-24 14:22, Processed in 0.032901 second(s), 4 queries, Gzip enabled.